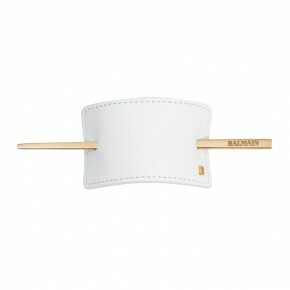 Add a touch of class to your ponytail or hairstyle with the Balmain Hair Barrette. The Balmain Hair Barrette is made of genuine suede and napa leather designed with 14k gold plated hair pin with engraved Balmain logo. Great for ponytails or to create effortless updo’s. Use: Comb your hair to the back and make a ponytail. Take the elastic and put it an extra turn around the ponytail. Take the Hair Barrette and pin it across the scalp. Use it as a finish for updo’s.